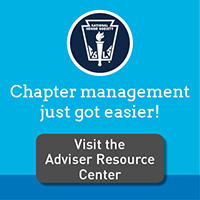 This quarterly e-newsletter offers the latest news, plus an idea or two you may wish to implement with your chapter activities. NEHS E-News is primarily intended for NEHS advisers and school leaders, but anyone interested in receiving the newsletter can subscribe. Please note, NEHS adviser members automatically receive NEHS E-News. If you are an actively affiliated school and you are not receiving NEHS E-News, please make sure to add nehs@nehs.org to your address book and/or contact your email system administrator to ensure delivery. Spring 2019. Earth Day is April 22! National Student Leadership Week (NSLW), sponsored by the national office of the National Honor Societies and National Student Council, celebrates the important contributions student leaders make to the climate and culture of their schools and communities. Many NEHS chapters celebrate their induction in the spring.